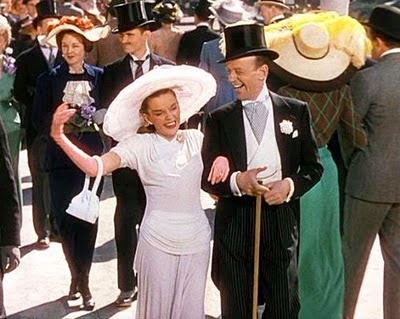 This week's song is Easter Parade performed by Judy Garland and Fred Astaire in the 1948 movie of the same name. While there are hundreds of Christmas songs in old Hollywood films, Easter is often overlooked. Easter Parade is one of the few songs that celebrate Spring's biggest holiday and it's still quite popular today. Judy Garland and Fred Astaire promenade on Fifth Avenue in Easter Parade (1948). Easter Parade was written in 1933 by Irving Berlin for the Broadway revue, As Thousands Cheer. The revue was based around newspaper headlines and Berlin, who never met a holiday he didn't love, reworked a tune he wrote in 1917 called Smile and Show Your Dimple to fit one of New York City's annual traditions, the grand Easter parade on Fifth Avenue. The parade began in the 1870s as a solemn religious display by the congregants of the many large churches along Fifth Avenue. The parade rapidly evolved, eventually becoming much more of a fashion show, where New York's high society ladies could show off their expensive gowns and lavish hats. 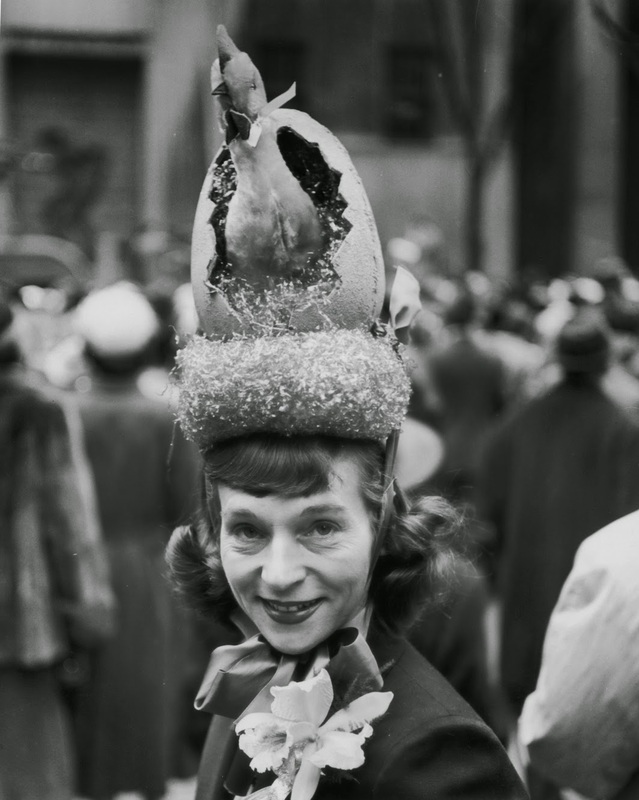 A woman with an elaborate hat joins the Easter parade in the 1940s. The Easter parade was a popular event with New York's newspapers. Photographers competed to get pictures of the most expensive gowns and most elaborate hats for their readers. The parade became so popular that it even attracted protesters: some moral guardians fulminated that the parade was sacrilegious and in the Great Depression unemployed workers in rags joined the parade to draw attention to their plight. The Easter parade is still going strong today with thousands of people coming out in their Easter finery to promenade up and down Fifth Avenue. Many participants wear outlandish hats or dress their pets in Easter costumes. 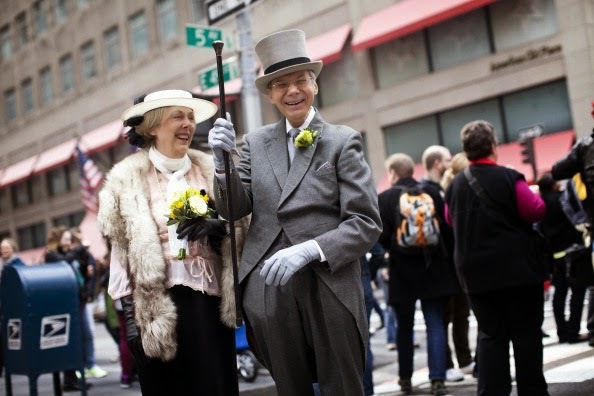 This couple show off their finery in the 2013 Easter parade. Easter Parade first appeared in films in the 1938 musical, Alexander's Ragtime Band. The song was also featured in Holiday Inn (1942). Here's a clip of Bing Crosby warbling the tune to Marjorie Reynolds. Easter Parade continued to be a popular hit for artists like Perry Como, Harry James and Guy Lombardo and His Royal Canadians. Here's a fun clip of Liberace singing Easter Parade to his mother, Frances, who is dressed in her Sunday best.